First-round pick Adam Haseley took another step toward the big leagues on Monday. Paul Murphy, the area scout that covers the Virginia territory for the Phillies amateur scouting department, said he probably watched the athletic, left-handed hitting outfielder the team drafted last week at least three dozen times over the last three years. Adam Haseley, the Phillies selection with the eighth overall pick in last week’s MLB Draft, regularly put on a show both in the batter’s box and on the mound as a pitcher. As a freshman two years ago, Haseley hit a team-best .364 in the College World Series Finals against Vanderbilt and pitched five shutout innings in Game 2. It's been moving pretty fast and I'm trying to enjoy it the best I can. The last couple of days have been fantastic and I really enjoyed being on the field today. But, for Murphy, the moment he saw Haseley as a potential first-round talent came one summer night at Eldredge Park, home of the Cape Cod League’s Orleans Firebirds. The hope for the Phillies is that the 21-year-old Haseley, now a former pitcher and full-time position player, can really develop into a dynamic, power-hitting outfielder as a pro. 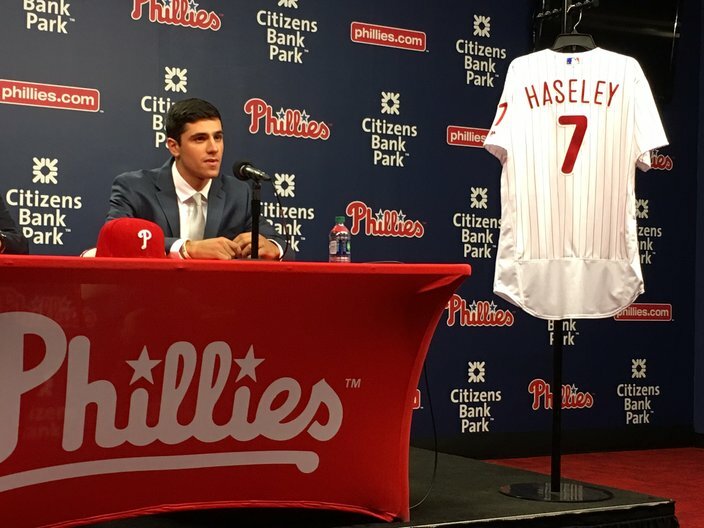 On Wednesday, less than a month after wrapping up his collegiate career at the University of Virginia, Haseley was officially introduced as a member of the Phillies organization. In the morning he signed his first professional contract (reportedly a $5.1 million signing bonus, slightly over slot value for the 8th overall pick) and in the afternoon he joined a hitting group with Maikel Franco and Freddy Galvis during pregame batting practice at Citizens Bank Park. The next step for Haseley? He’ll board a plane bound for Florida. Since he hasn’t played a game in more than two weeks, Haseley will work out at the Phillies spring training facilities in Clearwater, Fla., before the organization’s player development department formulates a plan for the start of his professional career. Where that career will begin is a bit of a tricky question for the Phillies, all because fellow center fielder Mickey Moniak, the top pick in last year’s draft, is playing his first full season at Low-A Lakewood this summer. Haseley would probably be ticketed for Lakewood in any other year to get started, but the Phillies want both top outfield prospects playing regularly in center field. Although short-season Williamsport seems likely – it’s often the first stop for recently drafted college players – we brought up the fact that it might not make much sense to have Haseley, who is two years older than Moniak, playing in a level behind last year’s No.1 overall pick. It would be aggressive to start Haseley at Class A Clearwater (in that same aforementioned column, we wrote about where recent, top 10 college bats who have gone on to have MLB success began their own minor league careers) but it’s apparently not out of the question. And if the Phillies hope to see Haseley in the big leagues within two years, starting him at Class-A Clearwater would get him moving quickly in that direction, with the possibility of reaching Double-A next summer. Even if Haseley starts in Williamsport, there’s a chance he could still jump up to Clearwater before the end of the summer and continue to develop as a center fielder without interfering with Moniak’s progress as a top center field prospect, too. 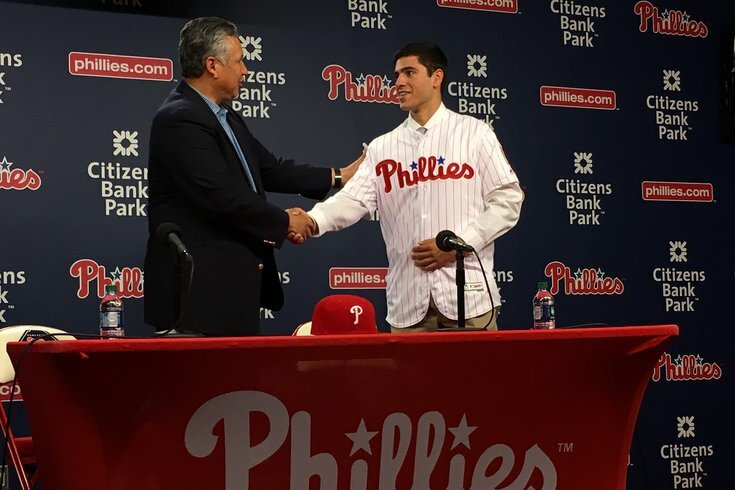 Phillies first-round pick Adam Haseley was introduced at Citizens Bank Park on Tuesday, when he signed his first pro contract and took a round of pregame batting practice, too. Regardless where Haseley starts, Murphy is excited to see where the left-handed hitter finishes in the next two to three years. Haseley hit twice as many home runs his year (14, in 58 games) as he hit in his first two years at Virginia combined (7 in 128 games), sported a .491 OBP, and also had twice as many walks (44) as strikeouts (21). Although he wasn’t even the top Virginia player drafted (first baseman Pavin Smith went one pick before him to the Arizona Diamondbacks), Haseley led his team in batting, hits, home runs, runs, doubles, walks, and total bases. And that was while working as the Cavaliers ‘Sunday starter,’ too, taking the mound for the final game of their three-game weekend series this season. “His trajectory really was upward, from his freshman year (to now), he’s made progressions,” Murphy said. “The fact that he pitched, last offseason was the first time he trained as a hitter. It really leads you to believe that the best days are ahead of you if he just concentrates on hitting. So he made a big jump this season with his power numbers.